If you are looking for the very best gun safe around then there are a number of big name brands to look at. Among the very best of these brands is Cannon. If you’re in a rush, scroll down for a quick summary of our cannon gun safe reviews. Renowned for large and sturdy safes with a traditional look, this company has an extensive variety of products for you to choose from. Therefore, it makes sense for you to check out some Cannon safe reviews to find the models that suit you best. To help you make a good decision we have listed below some of the most popular models and discussed their main features. Before we get started on looking at specific models on our Cannon gun safe reviews, you might like to know a bit more about the brand first of all. 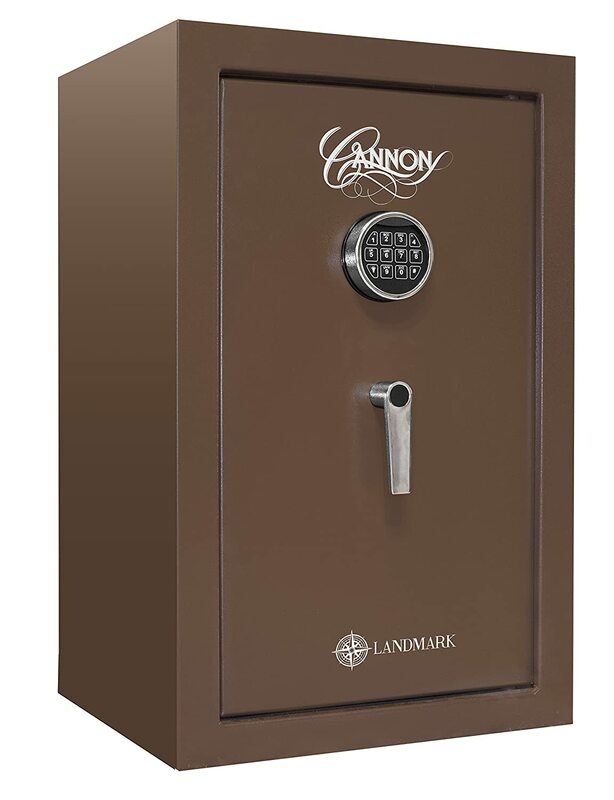 Cannon has been around since the mid-1960s and in that time it has built up an enviable reputation for producing top quality gun safes. Their reputation is built on selling excellent safes that certainly aren’t the cheapest on the market but that give total peace of mind for years. By using a combination of classic designs and the latest technology they can offer safes that look fantastic and that also do their job without any problems. It is worth pointing out that Cannon is now part of the Alpha Guardian group that also markets the Stack-On range of home security products. However, the well-known Cannon logo continues to appear on their safes. The size of the Cannon range of gun safes means that you are spoiled for choice. In fact, you might find the selection to be slightly overwhelming when you first start looking through your options. This isn’t helped by the fact that they all look kind of similar at first glance. This is why we have put together the following series of Cannon gun safe reviews for you to browse through. With the help of these details you should find it far easier to make a sound decision. Whether this is your first ever gun safe or the latest in a series of them, you can find out everything that you need to know right here. 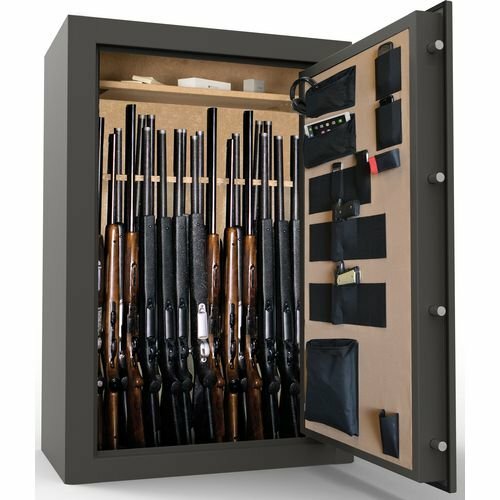 If you need a big, attractive gun safe that you can depend upon then the Cannon All Rifle 5936 safe is a great choice. This spacious safe has a huge 42 gun capacity that should mean that it is big enough for most homes or businesses. It also comes with a 45 minute fire rating, so that it also a good place to store other valuables such as important documents. Once you open it up you will see that it is set up to make life easy for you. From the interior upholstery to the door organizer kit and the rifle shelving, this is a comfortable safe with a well thought out design. It is a genuine pleasure to store and remove guns from a quality safe like this one. The security features that are included give you an easy access electronic lock that controls sturdy 4 inch locking bolts. You can buy with confidence, safe in the knowledge that it comes with the Cannon Safe lifetime replacement promise. This model weighs a hefty 450 pounds and its overall measurements are 20 x 36 x 59. Smaller and more modestly priced than the model we just looked at, this Cannon Foxtrot 24 safe is still an impressively solid safe. It is imposing to look at and does a great job at keeping intruders at bay. In fact, it seems safe to say that many intruders who look at this gun safe are likely to give up without making much of an effort to force it open. This model has a 24 gun capacity and will withstand a fire for 30 minutes. The triple fin intumescent sale means that smoke won’t get in to do any damage either. You get all of the usual Cannon safety features, so you can store your firearms and valuables in here without any worries at all. As well as this brand’s normal lifetime promise, you also get a 5 year warranty that covers you in case it is damaged by fire or stolen. The safe weighs in at 290 pounds and measures up at 18 x 24 x 59. For a stylish and elegant way of keeping your guns safe, it is hard to beat this attractive Cannon Landmark 3220 gun safe. The impressive 60 minute fire rating means that this is a great place to keep those documents and other possession that simply can’t be replaced. It comes with 4 robust 4” locks and a triple fin intumescent seal. The whole things weighs in at 174 pounds and it has dimensions of 18 x 20 x 32 inches. This means that is far from being the biggest and heaviest product in the range of Cannon safes. As we have come to expect from this popular and highly trusted brand, the locking and opening mechanism is easy to use but gives a great deal of confidence that no-one else could force it open. This is likely to suit someone who wants to keep a decent sized firearm collection safe but doesn’t really need the company’s top of the range models. 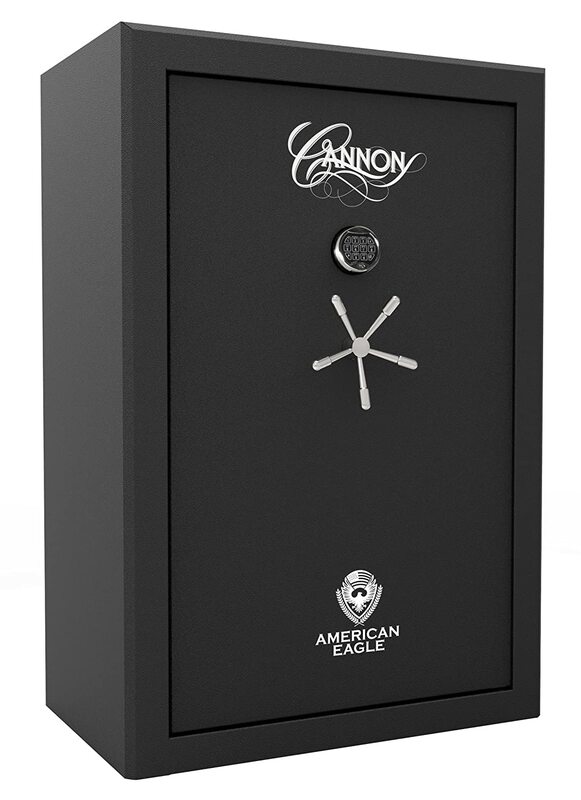 For the last of our Cannon gun safe reviews we have the Cannon American Eagle 5940. This is another classic looking safe from a brand that specializes in them. In fact, this is one of the company’s very best safes, with just about everything that you could ask for. Similar to some of the other models we have looked at but with more features, it has a 60 minute fire rating and no fewer than 10 4” locking bolts as well as a triple fin intumescent seal that stops smoke from getting in. The trulock internal hinges and triple hard plate help to add to the feeling of it being a safe that will stand up to even the toughest test. This model has capacity for up to 48 guns. If you want to remove any doubts about the safety of your firearms then this safe will do exactly that for you. It has a weight of 616 pounds and dimensions of 24 x 40 x 59 inches. The price may be too steep for some people. As we have seen, there are some wonderful gun safes in the Cannon brand. If you can afford to buy the best then the peace of mind that you get will be well worth it. Yet, you may wonder which of these models suits you best. While they may appear to all be similar at first glance, the following are some of the key factors to help you narrow down your search. The size. There is a fairly big difference in size between these safes. Choose one that will be big enough for your firearms now and in the future, but that also fits snugly into your home too. The weight. We can also see that there are some weight differences between these models. This is important in some houses, as a safe that is too heavy for the floor could cause problems. The fire rating. The models we have looked at all have either a 30 or 60 minute fire rating. This might sound very similar but if you have irreplaceable documents in there then those extra 30 minutes could make all the difference. The price. You won’t find cheap Cannon safes but you will hopefully find models that suit your budget. Considering that this is an investment that should give you a lifetime of peace of mind, even the most expensive models can turn out to be a sensible way to spend money. The looks. Finally, we all look for different things in the appearance of the gun safes that we use. Cannon specializes in solid, traditional looking safes that are heavy and imposing. However, you can find different colors and styles within their range so that you get the right model for your home.